Want to reduce the overwhelming smell of paint from a newly painted room? Slice up some raw onions, place them in a bowl of water, and leave them in the room overnight. In addition to adding an extra kick to your home-cooked meals, onions are a versatile vegetable that can also polish your metals, repel mosquitos, prevent frost from forming on your car windshield and cure your earache. Even the papery outer skin of onions can be used as dye for eggs, cloth, homemade paper and more. Not bad for a vegetable usually associated with giving you bad breath or making you cry. 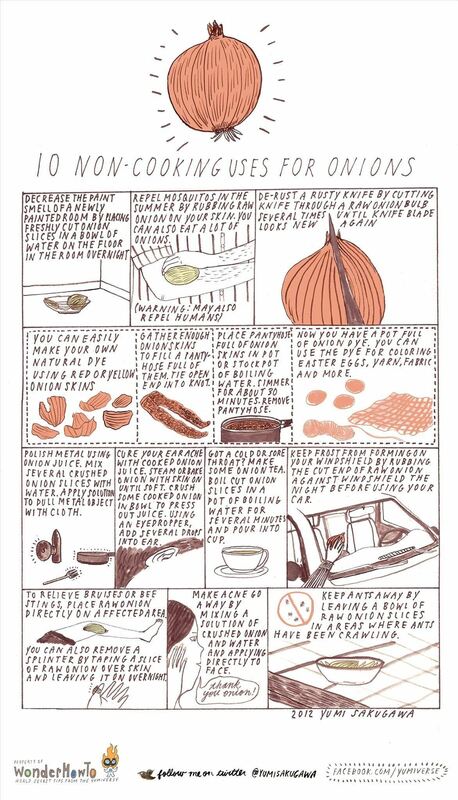 Got your own weird uses for onions? Share with us by commenting below. I recently used the raw onion trick for the minor ant problem in my kitchen. It seems to be working really well!